Heydarian, D., Miraei-Ashtiani, S., Sadeghi, M. (2014). Study on DGAT1-exon8 Polymorphism in Iranian Buffalo. 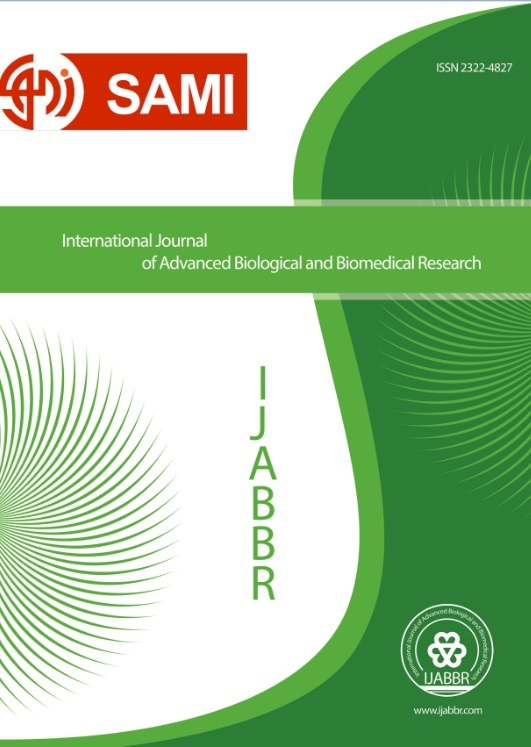 International Journal of Advanced Biological and Biomedical Research, 2(7), 2276-2282. Deniz Heydarian; Seyed Reza Miraei-Ashtiani; Mostafa Sadeghi. "Study on DGAT1-exon8 Polymorphism in Iranian Buffalo". International Journal of Advanced Biological and Biomedical Research, 2, 7, 2014, 2276-2282. Heydarian, D., Miraei-Ashtiani, S., Sadeghi, M. (2014). 'Study on DGAT1-exon8 Polymorphism in Iranian Buffalo', International Journal of Advanced Biological and Biomedical Research, 2(7), pp. 2276-2282. Heydarian, D., Miraei-Ashtiani, S., Sadeghi, M. Study on DGAT1-exon8 Polymorphism in Iranian Buffalo. International Journal of Advanced Biological and Biomedical Research, 2014; 2(7): 2276-2282. Objective: Diacylglycerol acyltransferase 1 is a microsomal enzyme that catalyzes the final step of triglyceride synthesis. The objective of this project is to check out the polymorphism at the exon 8 region of DGAT1 gene using PCR-SSCP technique in Iranian water buffaloes (Bubalus bubalis). Recent activities have shown that a significant association between lysine at amino acid position 232 with higher milk fat content, whereas an alanine at this position is marker data of lower milk fat content and higher milk yield. Methods: In this study we analyzed buffaloes from 5 provinces of Iran. Three PCR-SSCP patterns were found. Results: DNA sequencing analysis showed that all of the patterns had the motif “AA” at position 6962-6963 (K allele) encoding lysine, which is similar to “AA” at position 10433-10434 in Bos indicus and also different buffalo breeds at position 6962-6963. Therefore exon 8 is a conservative region in Bos indicus and all buffalo breeds which is associated with higher milk fat content. Moreover, we found a base transition at position 7036 C/T and we have heterozygosity of both “C and T”, which is located at intron 8 of DGAT1 gene in few samples. Conclusions: this transition is a nonsense mutation which causes no change in amino acid sequence. This mutation has occurred at the intron 8 of DGAT1 gene in Iranian buffaloes.